I just finished coding another wordpress theme that I’ll present today here on Azmind.com. It’s called YAMINTH (Yet Another Minimal Theme), it’s a free wordpress theme and, as you may notice from the name, it has a very minimal look. Since minimal design is very popular these days, I decided to create a wordpress theme with a modern and minimal style. YAMINTH comes with light colors, dark footer, Google Web Fonts and jQuery fade in/fade out of images. It also has an Options Page so you can customize it as you like. You can set your logo, favicon, featured category, social networks links, advertising, etc. Let’s take a closer look at YAMINTH’s features. – WordPress 3.0 custom menu. – Logo, advertising space (468 x 60) and social network links (Facebook, Twitter) that you can modify from the Options Page. – Custom Favicon. You can insert the favicon url in the Options Page. – Featured posts section with the last 4 posts from a featured category that you can choose in the Options Page. – Posts shown in Excerpt View. – Automatic generation of thumbnails (with TimThumb). – Threaded comments and Gravatar support. – Advertising space that you can modify from the Options Page. – About Us space. You can set it in the Options Page. – Latest Tweets. You can set your Twitter ID and the number of tweets you want to show from the Options Page. – Newsletter subscription form. You can set your Feedburner ID from the Options Page. – jQuery fade in/fade out of images on mouse hover. YAMINTH is released under the GNU General Public License version 3.0. You can use this theme in personal and commercial projects. But please refer to this page if you want to publish it somewhere else. For jQuery use its license. The images used for the YAMINTH preview come from Desktopography.net. The theme is no longer maintained. If you want you can download it below and try it or modify it as you like. That’s all! Let me know what do you think about the YAMINTH theme and don’t forget to follow me on Facebook and Twitter for other updates and freebies. Enjoy! 07/11/2012: Twitter feed problem fixed. Are You Looking for a Premium WordPress Theme? * Disclosure: The 2 links above are “affiliate links.” This means if you click on the link and purchase the Divi theme, I will receive an affiliate commission. simple and modern theme! but many have problems in reading the posts (bright font). is there any way, i can make the letters darker a little? Yes, you have to edit the “style.css” file. i am new to website managing. so please help me do it. exactly where should i edit it and how to do it. please help! Hi, thanks for this great work, but i have problems with timthumb and featured image with some errors like lightbox.css missing and twitter errors. So is there any fix? Hi, I’ll fix the lightbox and twitter problem soon. What’s the problem with timthumb? Is there anyway we can make featured post dynamic and random posts, instead just last 4 ? it is a beautiful theme! how do I edit the title? I’ve done customise, but it’s showing the blog title as Yaminth, not my title… not sure where to edit? 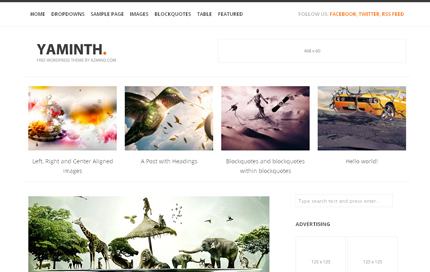 Nice and Wonderful WordPress theme. Well made theme, like it very much. I have a question, is it possible to add slide on the top side of the homepage? Yes, it’s possible. You have to customize the theme. I really love this theme. Any chance of a responsive mobile version in the future? Thanks. Maybe in the future. the theme is compatible WP3.8.1? Why was it not the theme in the official WordPress.org themes directory? Possible to put an image in the background and have some of the articles and sidebar white? This is a theme Responsive? Possible to remove the script Timthumb not trust since he had a big security hole, I avoid it. I love this beautiful theme but am having a hard time with one issue. Please Help! I’m stuck trying to set a feature image for the pages displayed across the top. I’m unable to set a feature image or to get the top image in the post to show up as the tumbnail. Any hints?? Thanks! Hi, this theme is beautiful but I have absolutely zero idea how to download it. A bunch of folders came up and I was wondering if you could provide me with instructions for how to download it? Thanks. You can download it from the link above. Thanks Javier. Yes, I know that the “Latest Tweets” section doesn’t work. I think I’ll fix it in the next version of the theme. I have an unusual problem. The comment form doesn´t appear. What´s wrong? It seems you’ve fixed the problem now. Love these themes. i am waiting for some responsive themes. This is a beautiful theme! Too bad it’s not responsive, otherwise I’d use it for one of my projects right away. One of the best free themes I’ve seen. Thanks a lot! Thanks Anuj! I’m glad you like it. Hey is it easy to integrate woocommerce to this?